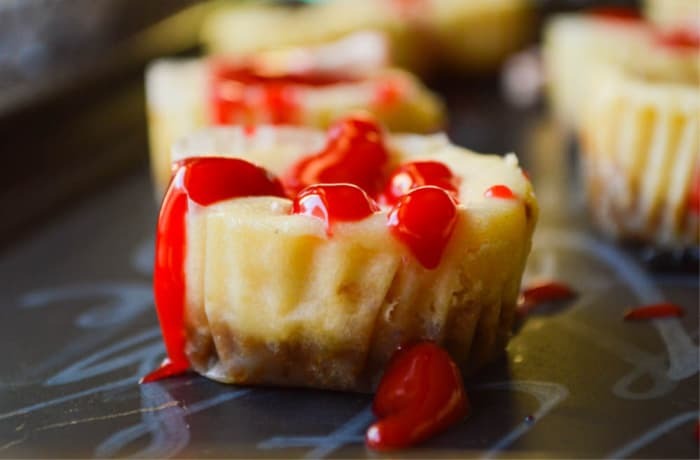 Bloody Good Mini Cheesecakes are bite-size cheesecakes on a gingersnap crust covered with a spooky blood red homemade gel frosting. This post was created for a project called #HalloweenTreatsWeek! I was sent samples by some really fun companies for use in some Halloween recipes, but as always, all opinions, the original recipe, and photos are my own! 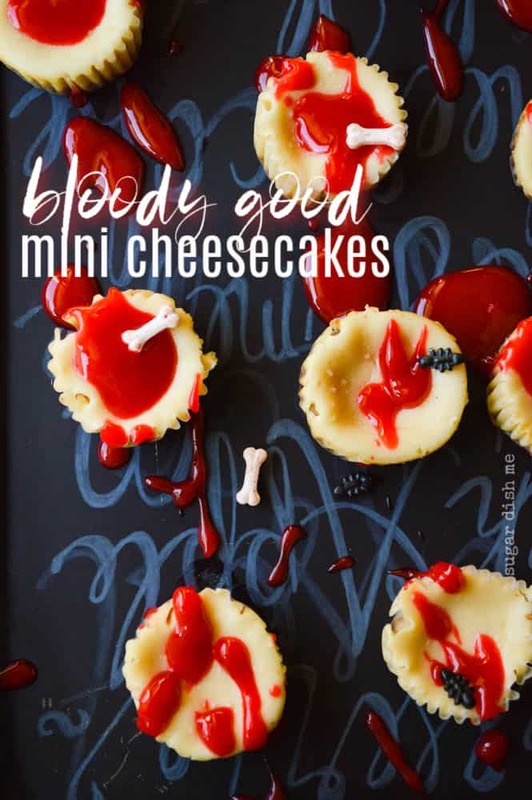 When I decided to make Mini Bloody Good Cheesecakes, my initial idea was to just make small versions of my Bloody Good Cheesecake. Chocolate shortbread crust, red velvet cake, spooky gel frosting. But as I started playing around with things, I decided it would be fun to have the contrast of the bright red “bloody” gel frosting against a standard creamy cheesecake. 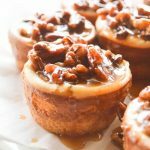 I added my favorite spiced rum to my mini cheesecakes, but that’s optional for you. The rum actually makes this recipe a play on Bourbon Cheesecakes for Two, just minus the boozy chocolate. I had a ton of fun playing with decorating here. If you are a new reader, you don’t know about my sad lack of decoration skills that consist of sprinkles and throwing frosting around. This Day of the Dead Cake that my friend Karyn made? That is outside my scope of talent. Slimeball Hi Hat Halloween Cookies are as fancy as we get over here. I used a couple of products here that gave me great depth of color and flavor. Let’s talk about clear vanilla AKA FAKE VANILLA FLAVOR OMG. I am usually 100% opposed. Awhile back I worked in this little store, and they sold this flavor that was some kind of church fundraiser and people went wild for it. Wanting to know what all the hubub was about, I bought a few varieties and tried them myself. 13/10 would not recommend. I can always tell when the extract is IMITATION. And it’s always gonna be a no for me. BUT! Clear vanilla extract has its place. It’s perfect for white cakes and icings. If you wanna make a snowy white coconut cake? You need clear vanilla. Adam’s Clear Vanilla Extract was a win for me. I used it in my gel frosting so that the red would stay bright and pure, and not be diluted by the dark color of real vanilla extract. 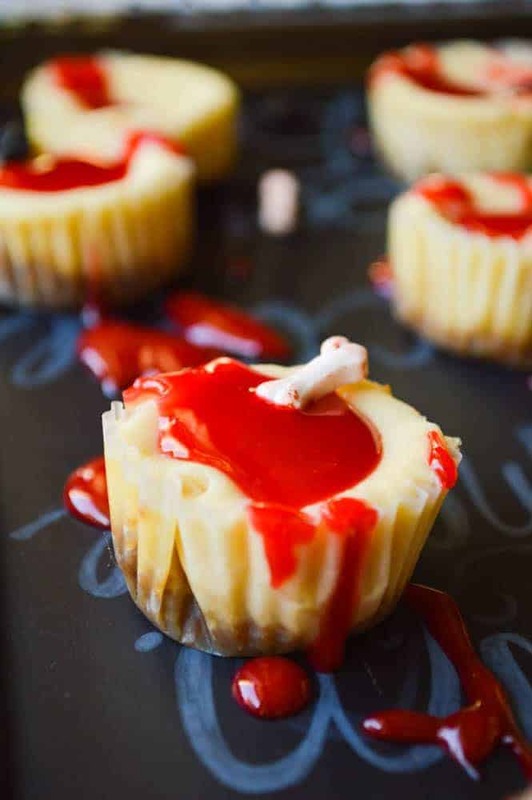 I really wanted tiny knives for these Halloween cheesecakes. A plate that looks like a good thrasher film is the direction I was headed. No dice though. I never found them even though I was positive I’d seen tiny knife sprinkles last Halloween. So I ended up using These bug sprinkles from Wilton. These bloody bones sprinkles, also from Wilton, were leftover from last year and were a good fit. 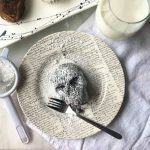 Black Magic Skull Cakes are DENSE and INTENSE in appearance as well as flavor. They are also REALLY simple to make and the actual cake recipe is one I will use on repeat forever and ever amen. 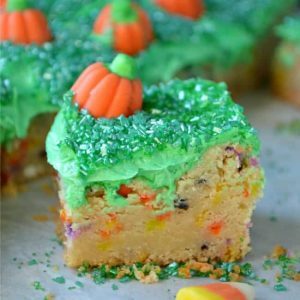 Halloween Sugar Cookie Bars are sweet, loaded with sprinkles, and topped with buttercream. 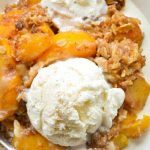 This recipe is great for the kiddos and for taking a pan of treats to work. 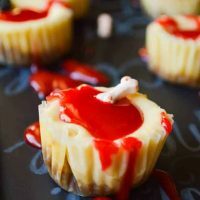 Keep scrolling past the recipe for links to all the other recipes included in #HalloweenTreatsWeek ! 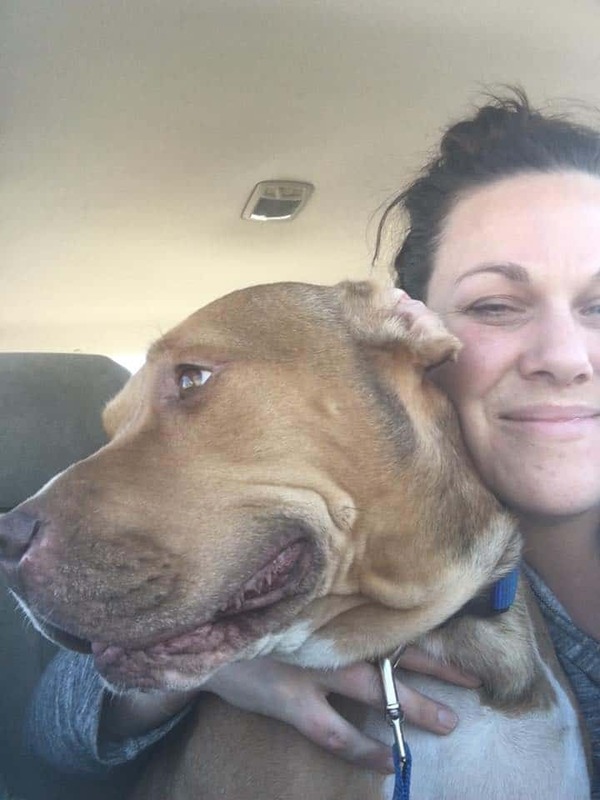 There are some good ones! Preheat the oven to 350°F. 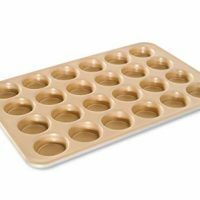 Line a mini muffin pan with paper liners (you will only need 16-20). Combine the gingersnap crumbs, brown sugar, and melted butter. Press the crumbs into the prepared liners. In a large bowl beat the cream cheese and sugar until fluffy and smooth. Add the egg and beat for about 1½ minutes. Add the vanilla, cream, and rum (if you are using rum). Beat until combined. Divide the batter evenly between the two par-baked crusts. Bake at 350 for 8 minutes. Reduce the heat to 275 (I like to open the oven door for just a minute to help the temperature drop) and bake for 10 more minutes. Turn the oven off and let the cheesecakes cool IN the oven. When they have cooled to room temperature, remove and refrigerate. (Sometimes I am in a hurry so I take mine out when it is cool enough to grab by hand -- the pans will still feel warm) The cheesecakes will need to chill for at least an hour (from room temperature). To make the gel frosting, stir together the cold water and cornstarch until smooth. Pour it into a small saucepan and bring to a simmer over medium heat. Pour in the corn syrup and whisk until the mixture is heated through and smooth. You will need to stir frequently; you can watch it thicken as it cooks. Remove the mixture from the burner after 1-2 minutes. Stir in the clear vanilla and red food color. I used about ½ teaspoon of color to achieve the look here. Let the gel cool a little before spooning it over the cheesecakes. You can whisk in water a tablespoon at a time to reach the desired consistency if you think that your gel frosting is too thick. 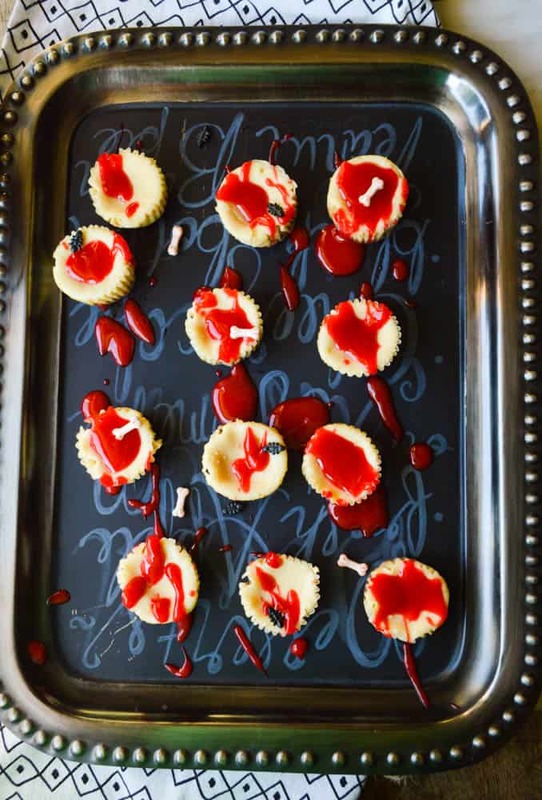 These cheesecakes look “bloody good!” Love the decorations. Thanks for your thoughts on the clear vanilla.